Machete Tours is an eco-tourism company running enlightening and entertaining cultural, wilderness and activity tours in South America. Due to the high quality operations we provide and the extensive range of tours that we offer our company has been growing consistently since Tine and myself founded the business 11 years ago. Here at Machete Tours we love to introduce clients to the wonderfully diverse cultures and people of the Andean Countries. From stories of ancient Inca creation Myths told amidst the misty and dramatic ruins of pre-Colombian citadels to living demonstrations of Peruvian festivals and insights into day to day life Machete Tours can guarantee ethical adventures that are both rich and inspiring. 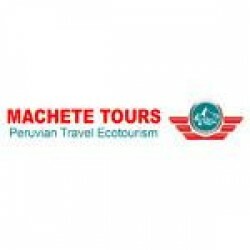 Machete Tours shares income from tourism fairly, providing material support for a wide range of communities were we operate and a financial incentive to maintain and cultivate traditional practices in a world were globalization is rapidly eroding traditional cultures. In addition to our culturally focused tourism projects we also specialize in adventures in the South American wilderness – treks into the high Andes, along ancient Inca Trails and to the foot of spectacular glacial peaks. Peru is one the Bio-diverse countries on earth, boasting the Atacama desert along the coast, the vast icy mountains and volcanoes of the Andes and the great bio diverse hothouse of the Amazon Rainforest to the East (The Peruvian Amazon alone covers an area larger than France!). It was here in the Jungle that Machete Tours pioneered its eco-tourism operations in and around the incredible UNESCO World Heritage Site of the Manu Biosphere Reserve. Machete tours sponsored tourism here goes to indigenous communities and provides an incentive to keep the rainforest and it’s wildlife in a pristine state – a truly long-term vision that contrasts against logging and mining operations that provide short term financial benefits but long-term destruction and poverty.